Alan Stubbs knows what to expect from the play-offs his Hibs side are now facing – the unexpected. The Easter Road boss has first-hand knowledge of how such matches can change in an instant having been part of the Bolton Wanderers side which clinched promotion to the Premiership in the most dramatic of fashions. Two down in 12 minutes to Reading in the Championship play-off final of 1995 at Wembley, the Trotters looked consigned to another season in the lower division as Stuart Lovell stepped up to take a 34th-minute penalty. The midfielder missed but, even so, as the minutes ticked away the massive prize on offer still looked to be Reading’s for the taking. But an Owen Coyle strike 15 minutes from time threw them a lifeline, one which was seized as half-time substitute Fabian de Freitas equalised with only four minutes remaining. Mixu Paatelainen put Bolton ahead in extra-time, De Freitas added a fourth but Stubbs and his then team-mates were forced to endure a highly nervous final few seconds as Jimmy Quinn added a third for Reading. Stubbs, who had also suffered defeat at the hands of Liverpool in the final of the League Cup that season, said: “I think the one thing we have seen with any play-off system is that it does not necessarily go to form, it doesn’t mean the team that finishes second goes up. “This is a new thing in Scotland, but we have seen in England the team finishing sixth go up. Here we have three teams [Hibs, Rangers and Queen of the South] that are very close as in results this season, not necessarily in size or in stature of the club. 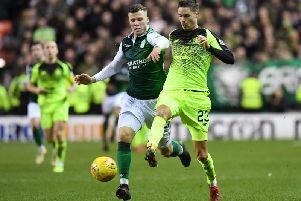 As yet Stubbs doesn’t know whether Hibs will be facing Rangers or Queen of the South in their first play-off match on Wednesday although the Easter Road head coach will be at Ibrox to see that matter settled. He also has eyes on not only overcoming the winners of that tie but, should the Capital club make it, the Premiership side who will provide the final obstacle to promotion. Taking Hibs back into the top flight would, Stubbs admitted, provide the “first real high” of his fledgling managerial career, expressing the natural hope that it will prove to be the first of many. He appears to have made the transition from under-21 coach at Everton to a manager in his own right with little difficulty although some may have felt entrusting Hibs’ immediate future in the hands of a “rookie” was too much of a risk. But the appointment, made after a lengthy interview with chief executive Leeann Dempster and head of football operations George Craig, has paid off. The former Celtic and Everton defender has played a major role in hauling a club which was pulling itself apart in the wake of relegation back together again, restoring the fans’ pride and giving them a team playing the style of football they want to see. For his part, Stubbs concedes he was lucky to find a club of Hibs’ stature as his first managerial post although it is one he has taken in his stride. He said: “It’s been nothing surprising really because I was virtually in a management team with Everton. The difference obviously is under-21s football is not results orientated, it’s all about performance and development whereas this is all about results. “That’s been the biggest change for me but it’s one that I feel not just me but my staff have relished and the players have responded to everything we have asked of them. “If we are doing well on the pitch everything behind the scenes is a whole lot easier in terms of discussions, renewals of commercial contracts, everything. “So what we have done from that point of view is to make it a lot happier place to work and we want that to continue because it’s not just the team but the club. Stubbs hopes he and his players can widen those smiles further by clinching promotion, the determination to do so underlined by the decision to take his squad to La Manga in Spain for a week-long training camp in the sunshine having been left with an 18-day gap between their last league game and the first of their play-off matches. And, he believes, it’s a move which has paid off. He said: “It was absolutely perfect, the facilities, the pitches were all top drawer. I’d never been there before but I’d heard a lot about it and it was what I anticipated it would be. “The players loved it. I have been in their shoes before and I know when you go to a climate, an environment where it’s all really good they enjoy it. However, what Stubbs has achieved so far has involved personal sacrifice with his wife Mandy, his son Sam, who is on the books with Wigan Athletic, and daughter Heather continuing to live on Merseyside. He said: “I really enjoyed Scotland when I was here on the other side of the country and Edinburgh is a lovely city, a great place to live and I am very comfortable. “But it’s difficult because of the family. They have always been understanding. They are at an age where I cannot move them, they have their own lives to live. “In the past they’ve had no choice in the matter, they’ve always come with me but now they have a choice.